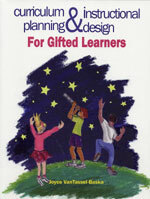 This comprehensive text establishes an exciting curriculum design model that caters to the unique needs of the gifted learner. While giving careful consideration to the current climate of educational reform, the text is able to preserve and enhance the invaluable enterprise of gifted education. The author’s extensive experience in the field of gifted education makes this text an invaluable resource for students and teachers alike. Ambitious and impressive in scope, the text gives thorough attention to crucial issues such as effective curriculum delivery, implementation strategies, and learner-outcome assessment. Copyright © 2012 Love Publishing Company - All rights reserved.